Looking for a way to improve your golf game? The concepts of Real Swing Golf are so powerful that we can improve golfers games' without ever teaching them in person! I came across your Youtube videos on Tuesday night and watched the 8 part series explaining your concept and I had the paradigm shift you mentioned. Mind-blowing! 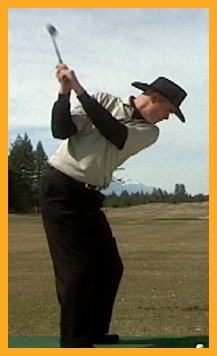 I have been training regularly using [another teaching philosophy that focuses mostly on swing mechanics]. Over the last year I made some good progress [with that method] and have gone down to a 10.7 handicap from a 13. Then, just by listening to you and focusing on the club head and being relaxed and trying to accelerate through the hitting area etc instead of focusing on the mechanics etc., yesterday I shot the easiest 77 with 2 double-bogeys. Amazing! Yes, I also have a new Epic driver which is amazing and hit a lot of fairways yesterday. But my drives were longer than usual (230m [250 yards] to 270m [295 yards] yesterday) and my irons were so crisp. Even my 60 deg lob wedge around the green felt different. Yes, [the other] lessons certainly helped but for the first time, I didn’t focus on that at all which I do too much and often freeze over the ball and have terrible rhythm. Yesterday, I felt so relaxed and not burdened by having to think about what I needed to do before every shot. Just closed my eyes and took a few practice swings feeling the club head, with relaxed hands and grip, and feeling the acceleration and lag through the hitting area. That’s all. Watching you hit these balls with so many mechanics “mistakes” was an amazing eye-opener and I went out there yesterday with the confidence that I didn’t need perfect mechanics to play well and it worked!!! I hope it’s not a fluke and cannot wait to play again and see if I can do it again. So I just wanted to write to you to say thank you, thank you, thank you! You have a new fan on the other side of the planet! I have never met or talked with Mr. Bechard; He just watched some YouTube videos explaining the genesis of the Real Swing Golf Method® and its simple concepts and instantly improved his score by about 5 shots!!! You might be sceptical because you may have heard this from your golfing friends: "If you take golf lessons, you'll get worse before you get better." While that may be true with traditional golf instruction ideas that are based on having you retrain your natural swing movements and positions to more closely resemble some famous PGA or LPGA Tour Pro who has a “bio-mechanically correct” swing, our exclusive Real Swing Golf Method® of instruction will have you hitting longer, straighter shots in no time… all without technically overhauling the swing you already have! At Real Swing Golf, we believe you can improve immediately… in 1 lesson!!! Take one lesson with us and if you aren’t hitting longer, straighter shots by the end of your first lesson, you don’t have to pay us. That’s right. At Real Swing Golf, you will get better in your very first lesson or you don't have to pay us! If the Real Swing Golf Method® can work for someone half way around the world on a small island in the middle of the Indian Ocean, we're confident that we can help you improve your golf game! We Can And Will Improve Your Golf Game! Call in and book your first lesson today!